The discovery of human remains during a child abuse investigation on Jersey has thrown the spotlight onto an island which some say has thrived on secrecy. Neither part of the UK, nor entirely independent from it, Jersey is a nine miles wide by five anomaly. The quirks of history, from which its blend of British and French culture evolved, have also rendered the island, literally, a law unto itself. Although tourists flock to its golden beaches, the island's status as a tax haven and its dark history of Nazi occupation loom large. And long before the latest abuse accusations surfaced, Jersey had gained a reputation for idiosyncrasy. The writer Victor Hugo - author of Les Miserables and a one-time Jersey resident - described the Channel Islands as "pieces of France dropped in the sea and picked up by England". History bears him out. When the English King John lost the Duchy of Normandy in 1204 to France, Jersey's inhabitants chose to remain loyal to their erstwhile Duke. The islanders were confirmed as subjects of the English crown, but were never absorbed into England nor, subsequently, Britain. They held onto their own judicial system, and remained more or less self-governing. 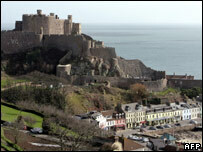 As a result, Jersey's official status is a British crown dependency. It relies on the British government for defence and international representation, but pays no taxes to London, sends no MPs to Westminster and retains its own Norman legal code. Culturally, it has developed into a curious blend of its two neighbours, where English is spoken but Norman names abound. Some islanders still speak Jerriais, an odd blend of Norman French and Norse. The ability of this tiny island, with a population of just over 91,000 to make its own rules (it does not belong to the EU) has allowed it to develop its status as a tax haven. With no VAT, no capital gains or estate tax and income tax capped at 20%, Jersey has attracted both wealthy incomers and investors attracted by the lure of offshore banking. Although its maximum speed limit is 40mph, the island has the highest concentration of Porsches in the world. But like any other tax haven, Jersey has relied on being able to keep private information away from the glare of prying eyes. Until 2002, it refused to share information on tax evasion with the world's largest economic monitoring group, the OECD. It only relented under threat of sanctions. This "culture of concealment", the island's former health minister Stuart Syvret claimed when interviewed by a BBC News website reporter when the Haut de la Garenne allegations became public, was responsible for Jersey's failure to address child abuse in its midst. 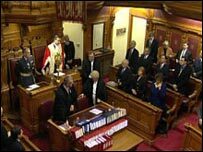 Jersey's parliament, the States, may be democratic: It is composed of 12 senators and 29 deputies, all directly elected, and 12 constables appointed by parish councils. But the lack of a strong party system - all members of the States are currently independents - has led to what Mr Syvert identifies as a lack of scrutiny and a "one-party state". But this ability to keep their own counsel in the face of outsiders has been a source of pride for many on the island - in particular, during occupation by Nazi Germany during World War II. Resistance was only ever passive, and an estimated 900 children were the results of liaisons between local women and German soldiers. But there was no pro-Hitler political movement as in other occupied areas, and no islanders were implicated in handing over Jews. 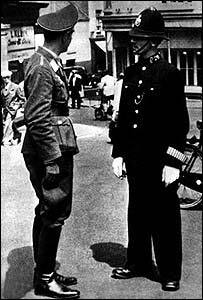 Indeed one Jerseyman, Albert Bedane, concealed a Dutch Jew, a French prisoner of War and Russian slave labourers from the SS. But, for now, the grim discoveries in Haut de la Garenne overshadow this heroism.